This recipe for Southern Italian stewed octopus with white wine and tomatoes originates in Puglia near the heel of Italy's boot. 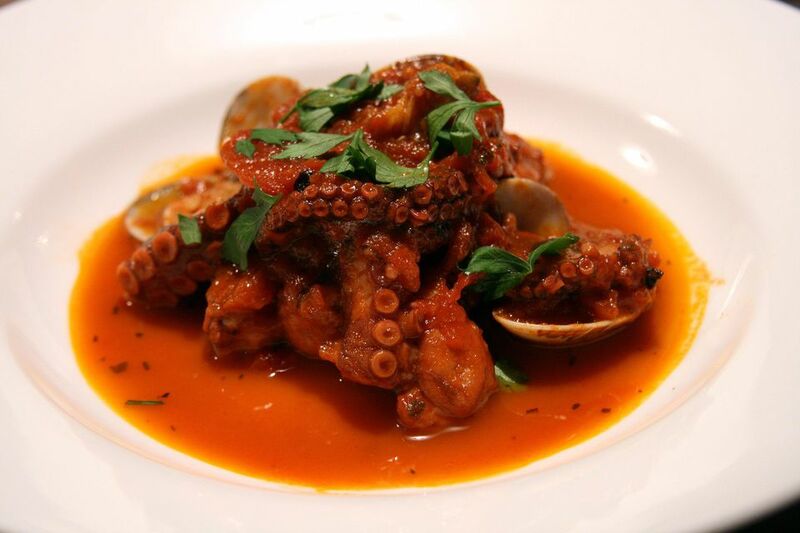 Octopus requires long, slow simmering, so keep the temperature low and give yourself plenty of time. This unusual dish is especially good made with baby octopus that you can find frozen in Asian markets, but you could use any octopus. Serve with crusty bread or a big pasta, like ziti or penne, for a special weekend meal or a casual summer dinner party. Bring a large pot of salty water to a boil. Toss the octopus into the boiling water, return to a boil and cook for 1 to 2 minutes, then remove. Discard the water. Cut the octopus into large pieces and sauté in olive oil over medium-high heat for 2 to 3 minutes. Add the chopped garlic and sauté for another minute or two. Add the wine and bring to a boil over high heat. Stir well and let it cook down for 3 to 4 minutes. Add the tomatoes and chili flakes and bring to a simmer. Add about a teaspoon of salt and the honey or sugar. Mix well, cover the pot and simmer for 30 minutes. At 30 minutes, add the optional capers, half the dill, and half the parsley. Check the octopus—sometimes small ones will be tender in just 30 minutes. If it is still super-chewy, cover the pot again and simmer for up to another 45 minutes. When you think you are about 10 minutes away from the octopus being done, uncover the pot and turn the heat up a little to cook down the sauce. To serve, add the remaining dill and parsley and black pepper to taste. Accompany with bread or pasta either hot or at room temperature. A crisp white wine like Spanish albarino, Italian Orvieto or pinot grigio makes a good pairing for this interesting seafood meal. Make Impruneta's Peposo, Their Signature Stew, at Home!